In the Sci-magickal world of Europe in 1920, the great Doktor Mabon introduced a mix of ancient and modern knowledge that ends the Great War in record time. His investigations made possible nearly human steambot servants, great floating dirigibles - and the most amazing discovery of all - Doktor’s Mannkopf Mounts! These bizarre animal-human hybrids that Mabon found on a lost and secret island became the secret weapon of the victorious Austro-German Empire. But there are dark secrets lurking in the shadows of this new bright science and dangers for those who do not understand it. Karl Drosselmeyer is a cadet in the Mannkopf Cadre who dreams of someday going to the Doktor’s fantastic island—but he also dreams of the alluring Maria. Otto Von Wertvoller is a fellow cadet doesn’t think that the ‘peasant’ Karl has any right to even look at the blonde girl and has ‘designs’ on Maria himself. He has an ally in her father and together they plot against Karl, who soon finds himself on a terrifying journey into a nightmare. Can Karl stop the evil Baron Von Wertvoller’s sinister plans that might lead to another war? Can Karl save Maria from a forced marriage? And what has Karl’s Sci-Magician Uncle done that might cause his nephew’s death - or worse? Only The Clockwork Nutcracker has a chance to stop the Baron’s deadly plot, but will it be too late to save Karl? With an evocative cover by susan Krupp and logo design and print formatting by Marzia Marina and Antonino Lo Iacono, CLOCKWORK NUTCRACKER is available now at Amazon at https://www.amazon.com/Clockwork-Nutcracker-Teel-James-Glenn/dp/1546901612/ref=tmm_pap_swatch_0?_encoding=UTF8&qid=1495902139&sr=8-1 and Pro Se’s own store at www.prose-press.com for 15.00. 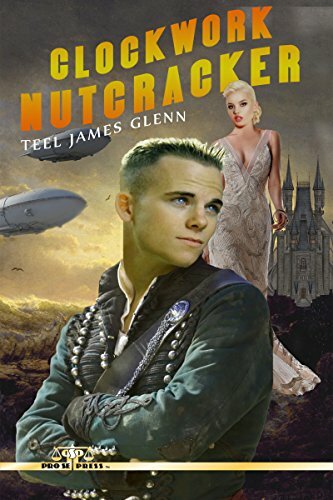 This sci-magick pulp adventure is also available as an Ebook, designed and formatted by Lo Iacono and Marina for only $2.99 for the Kindle at https://www.amazon.com/Clockwork-Nutcracker-Teel-James-Glenn-ebook/dp/B071ZJCR68/ref=tmm_kin_swatch_0?_encoding=UTF8&qid=1495902139&sr=8-1and for most digital formats via Smashwords at https://www.smashwords.com/books/view/726616.